You can recover emptied items from deleted items folder up to 30 days after they have been emptied providing support to accidental data deletion or sabotage. EAS provide SSL ports for all services. By default all configurations take place in SSL mode and provides on the fly data encryption and protection. Even Outlook Web operate in SSL providing protection when you work on your Outlook from unknown PC in a hotel and internet cafe. We are a Gold Level Partner with NTT/Verio and host primary services at their data centers. Global Data Center Datasheet : NTT America's Global Footprint will help extend your reach around the world. 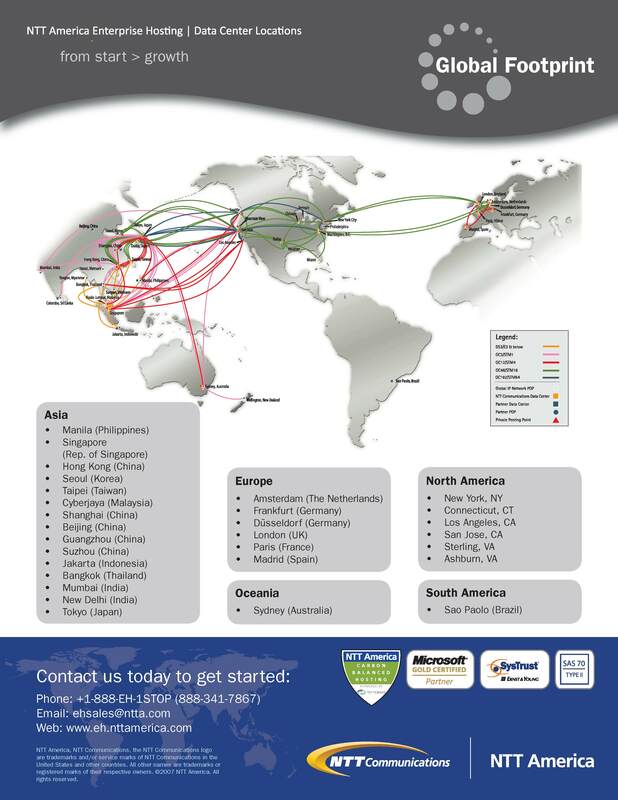 The Global Footprint datasheet includes data centre locations and details on the NTT global networks.